Today, let’s think about enjoying the weekend with good company and a fresh amber Mojito. The recipe below is a small variation on the traditional Cuban Mojito — it uses amber rum as opposed to a lighter rum. Enjoy in moderation! Cut the top of each sprig and set aside to decorate the glasses (as shown above). Cut the rest of each mint sprig in 4 pieces. Save and drop at the bottom of a tall pitcher. Cut limes in large wedges. Squeeze lime juice and drop wedges into the pitcher. Using a muddler, gently muddle into base of pitcher. This will release the mint oils and juices from the lime. Add rum and stir until all sugar is dissolved. Add ice cubes (about 4 handfuls). Add 1/2 to 1 cup of sparkling water depending on how strong you like your Mojito. Decorate by placing a few mint leaves in the middle of the glass and tchin-tchin (cheers)! Sparkling water — adding more sparkling water will make your Mojito feel less strong so top off your glass with sparkling water as needed. 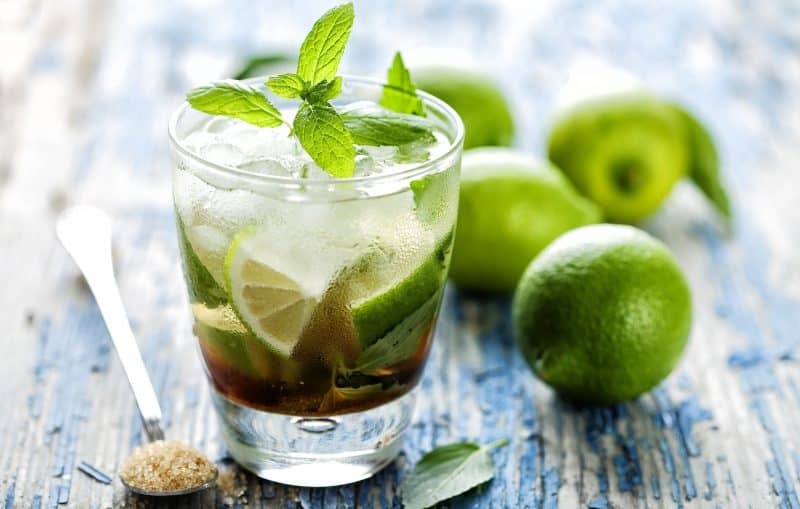 Individual glass — cut the recipe by 4 if you would like to make Mojito by the glass. The Mojito can be muddled individually. Big party — recipe can easily be doubled up if you have a big pitcher to serve for a bigger gathering. Growing your own mint — mint plants are easy to care for in the kitchen or on a deck so why not grow your own and grab mint sprigs or leaves as needed. Small mint plants can be found at any garden stores and some grocery stores offer it in their vegetable aisle.